Three months after the prime minister’s office directed the corporate affairs ministry to take action on the mess created by the maze of companies owned and operated by Infrastructure Leasing & Financial Services, more than a dozen ministries are picking up the pieces of the puzzle. The PMO has asked the ministries to file a comprehensive report on financial exposures and liabilities created during the UPA and NDA governments at the Centre, and under state governments. The exposure has been in infrastructure, social and finance sectors involving many ministries, such as road transport, power, renewable energy, drinking water, housing, urban development, shipping, water resources and finance. While the government-nominated board under banker Uday Kotak is putting stressed assets of the group companies for sale, the tangled web woven by former chairman Ravi Parthasarathy and managing director Hari Sankaran has made eyebrows go up. And, questions are asked about none seeking accountability from IL&FS, despite time and cost overruns. Even now, the cabinet secretariat or the PMO has not formed a steering committee to hold daily meetings to address the issues. Much has been left to the National Company Law Tribunal and the Serious Fraud Investigation Office, both under the corporate affairs ministry. 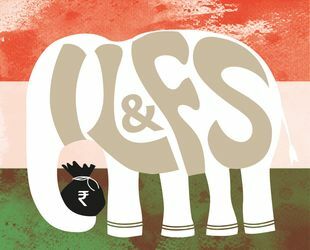 Even ministries with high exposure have not nominated teams to deal with the meltdown of IL&FS, which is unable to pay Rs90,000 crore of loans. It is a bigger white elephant than Air India, which owes around Rs50,000 crore to the Union government and banks. An examination has also not begun on how much of lobbying by IL&FS—which had many former and serving government officials in its subsidiaries—led to approval of mega projects without due diligence. The crisis has brought in the buyout predators of the marketplace. There are whispers of a cover-up to protect the reputation of the bureaucratic brotherhood. Interestingly, the Comptroller and Auditor General (CAG), who has done audit of Central government ministries, has not shown any pattern of the overreach of IL&FS across the ministries in reports submitted to Parliament. Now the CAG has received whistle-blower complaints and there is talk of a special audit. Political parties have not been aggressive on the frauds and irregularities in IL&FS, compared with the noise generated over cheating of banks by the likes of Vijay Mallya, Nirav Modi and Mehul Choksi. That is because kingpins of IL&FS did not exhibit the flamboyance of Mallya or Nirav Modi. With the term of the Lok Sabha ending in May, the issue has not yet become a political hot potato. But, the recent trend of minority shareholder activism, which has affected big corporates, can still influence governments, investigative agencies, tribunals and courts to ask tougher questions on the star-crossed dealings of a corporate group, which once had ambitions to be as big as State Bank of India and Life Insurance Corporation, two of the largest infrastructure lenders.